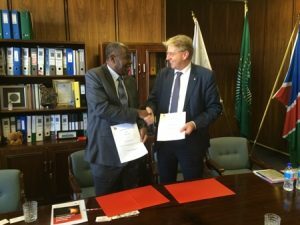 The Vice Chancellor of the University of Namibia, Prof. Lazarus Hangula and Prof. Gerard Meijer, president of the executive board of Radboud University, signed a Memorandum of Understanding today. This collaboration is a further step in the internationalisation of the Radboud University and a step in the development of research education in Africa. This agreement will form the basis for further cooperation in various academic fields. As a first step, the universities want to collaborate on astronomical instrumentation as Namibia provides excellent observing conditions for astrophysical research. Under the agreement, the universities will consider an exchange of academic staff, including Bachelor (Honours), Master, and Doctoral research students, for the purpose of joint research and teaching. To grow the partnership the universities will be organizing conferences, symposia, seminars, summer school courses, workshops, and public lectures and outreach efforts. The department of astrophysics is currently investigating possibilities to put a new radio telescope on a high mountain in southern Africa – the African Millimetre Telescope (AMT). The telescope shall participate in high-resolution imaging of cosmic radio sources, such as black holes and star forming regions. The agreement now provides the frame work to develop this project further in a joint effort. In order to finance the telescope Radboud University has put in place a fundraising team to attract private investors. The University of Namibia (UNAM) currently services 24,000 students spread over 12 campuses throughout the southern African nation of Namibia and is the premier academic institution in that country. The Department of Physics within the Faculty of Science is currently expanding its astrophysics and astronomy group and is actively participating in the High Energy Stereoscopic System (H.E.S.S.) from its inception, the Cherenkov Telescope Array (CTA), the Square Kilometre Array (SKA) and the African VLBI Network (AVN). Science Communication Radboud University, +0031 24 361 6000, media@ru.nl. Een internationaal team van onderzoekers gaat proberen de waarnemingshorizon van een zwart gat te fotograferen en zo eindelijk doorslaggevend bewijs leveren dat zwarte gaten bestaan en al dan niet werken zoals Einstein voorspelde. NIJMEGEN – Sterrenkundige Heino Falcke vertelt woensdag 17 juni in het Nijmeegse Science Café hoe de BlackHoleCam op zoek gaat naar het zwarte gat. De European Research Council kende in 2013 14 miljoen euro toe aan het BlackHoleCam project om het verschijnsel de “waarnemingshorizon” vast te leggen. Dit is de grens van de ruimtetijd waar voorbij niets uit een zwart gat kan ontsnappen. Falcke vertelt 17 juni van 20.00 tot 22.00 uur over het project in de kroeg The Shamrock. Eva Almagor verzorgt vanaf 19.30 uur live muziek. Toegang is gratis. https://blackholecam.org/wp-content/uploads/2016/08/zoom.jpg 600 800 Blackholecam https://blackholecam.org/wp-content/uploads/2019/04/bhc_flag_erc-1-300x83.png Blackholecam2014-10-01 00:00:582016-12-06 13:59:45Was Einstein right?